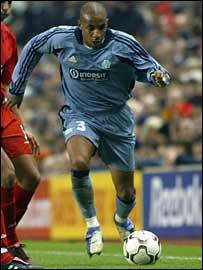 The Cape Verde Islands are hoping to persuade Manuel dos Santos from French club Marseille to play for them. They want the 30-year-old to help them in their 2006 World Cup and African Cup of Nations qualifying campaign that starts with a match against South Africa on 5 June. The defender was born in the Cape Verde capital, Praia, but is a French citizen. Despite being on the verge of the French squad several times he is yet to win a cap for the reigning European Champions. According to newspaper reports, the Cape Verdian coach Alexandre Alhinho had a meeting with the defender in Marseille. Dos Santos has played in the French first division for the last nine seasons, including two years at Monaco and three at Montpellier before he joined Marseille in 2000. The Cape Verde Islands made it into the group stages for the 2006 qualifying campaign with a 4-1 aggregate win over Swaziland last year. As well as South Africa, the islanders will take on DR Congo, Burkina Faso, Ghana and Uganda in Group 2.